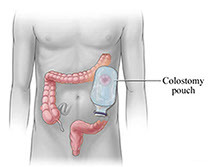 Colostomy: A portion of the large intestine is by-passed. A surgical procedure creates a stoma to eliminate body waste through the abdominal wall. Ileostomy: The end of the small intestines is surgically created through the abdominal wall by-passing the large intestines. A stoma is created. Urostomy: This occurs when the bladder is removed or by-passed allowing urine to pass out of the body through a stoma. Stoma Is an artificial outlet (opening) in the abdominal wall surgically created due to the need to allow an alternate method for the elimination of bodily waste.This artificial outlet functions to remove waste from the body. The stoma is round in shape, red, and moist. With all stomas you do not have muscles to control the elimination of waste. As an ostomate, you must wear an “appliance” to cover the stoma and collect waste. There are different bags (pouches) and systems to meet the needs and lifestyles of individuals. Appliance: An appliance consists of a flange and a pouch. There are two main pouch systems. a) One piece – The flange and the pouch are one unit. b) Two piece – The flange (base plate) is separate from the pouch. The pouch is removable from the flange. Many ostomates use a pouch cover over their bag (pouch) to provide a healthy image and assist with the heat, moisture build up under the pouch. Koolostomy Pouch Covers guarantee your satisfaction.